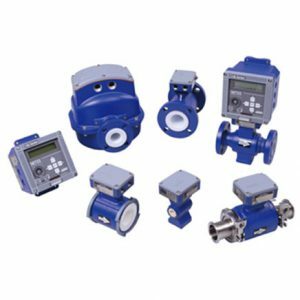 The 8000A and 8300 Series Flowtubes, together with a Model IMT25 Intelligent Magnetic Flow Transmitter, combine to form an easy-to-use, versatile Sanitary Magnetic Flowmeter. The flowmeter is an economical microprocessor-based magnetic flow system for use with most common everyday conductive liquids used in sanitary process applications. The transmitter converts the low level, high impedance signal from lined flowtubes to a standard scaled transmission signal, either 4 to 20 mA, digital, or pulse output, that is directly proportional to the volumetric flow rate.